You don’t have to be a country bumpkin to settle down at this exciting new yurt glamping site in the centre of England. In fact, the place seems to have a real penchant for attracting city dwellers and ‘townies’ looking for somewhere to escape. It’s certainly a prize spot for doing just that. Despite the way the yurts are nestled on a working farm – mixed miles of green rural space, parcelled up by bushy Leicestershire hedgerows – it also has ample modern amenities and an obvious air of luxury. Guests sleep in proper beds, with bedding and towels provided, and there’s a wood-fired hot tub for use. Throw in the site’s award winning farm shop and the local pub less than 100 metres down the road and you quickly start to see the appeal of the place. You could easily spend a weekend here and never venture beyond the village! 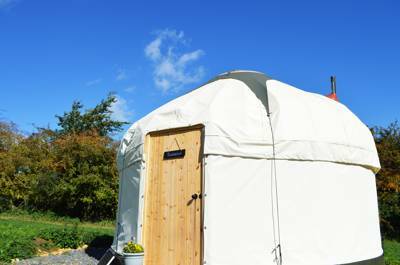 Opened in 2017 in the meadows of Waterloo Cottage Farm, the yurts are based on the traditional Mongolian design, with a latticed wooden frame and cream canvas, accommodating up to six people. 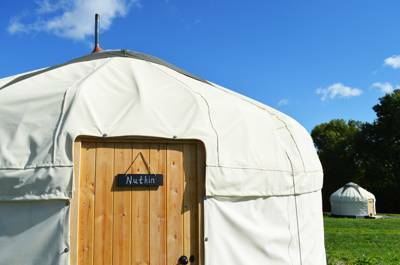 A third, smaller yurt in the same style accommodates two – a cosy retreat for couples. Inside guests find rugs, throws and tasteful, rustic décor, while bathrooms offer the same rustic-luxury vibe, with composting loos and powerful showers. Outside, meanwhile, the farm fills the place with extra life. Pigs, sheep and cattle dot the surrounding landscape – organically managed livestock that have helped the shop win its chest of awards – and some of the sheep are occasionally even welcomed around the yurts themselves. It’s a handy way to mow the grass. Cooking courses, barbecues and wine tasting lend yet more force to the argument simply to stay put and enjoying the farm, but if you do go elsewhere bringing a bike is always a good choice. The 14-mile-long Brampton Valley Way runs nearby and has transformed a dis-used railway into a pleasant cycle route and the towpath along the Grand Union Canal is popular, too. Pedal as far as Foxton Locks to enjoy watching canal boats making their way down the impressive staircase of locks that give the village its name. Then pedal home to your yurt. Or the pub next door. 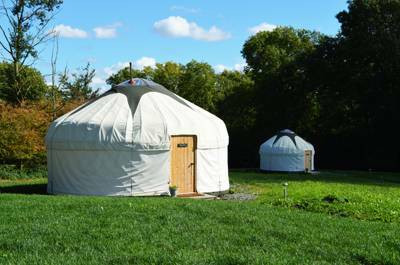 Based on an award-winning working farm in Great Oxendon, Country Bumpkin Yurts brings a new way to enjoy the East Midlands countryside. 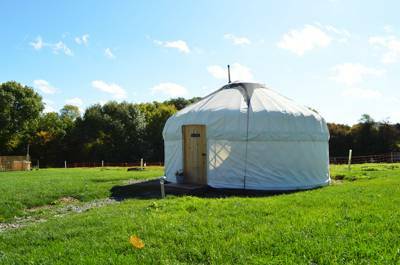 Unwind and get back to nature whilst staying in rustic luxury in a beautiful yurt. With an on-site Canvas Cafe, bridleways, great walking, cycling, leisure and eating out opportunities just a stones-throw away, you'll find plenty to do. We can’t wait to welcome you to your relaxing retreat. Our idyllic farm setting is the perfect place to unwind and re-connect with nature and the people you love. Whilst staying with us, you will get to see the workings of a family-run farm – Waterloo Cottage Farm. You will meet the lively little piglets, the highland cows, and the cheeky lambs. You’ll also meet the two friendly farm dogs who roam the site. Children especially love meeting the animals. For latest availability and best prices for Country Bumpkin Yurts, please use the Date Search above. Such a beautiful and relaxing place!! The yurts are so beautiful and getting to stay on the lovely farm and see all the gorgeous animals is a real treat. Facilities are fantastic - we fit 8 of us in the hot tub! Kitchen is clean and well stocked. Bathrooms are ideal and close to the yurts. If you do need stuff while you are there the farm shop is brilliantly stocked. The girls who run the site are fantastic - friendly and helpful but not over involved and let you get on with it. We will definitly be back! The ladies that run Country Bumkin Yurts were amazing. Nothing was too much trouble. My husband celebrated a big birthday and we sent them somethings to decorate the yurt it looked amazing and we took our dog she was allowed in the tea rooms with when had something to eat. I would highly recommend this place. We ordered a meat pack from the farm shop to have a barbecue, quality meat and service. Myself and three friends had a great time. Stayed for two nights 5th Oct 2018. Relaxed atmosphere. Enjoyed the camping experience in the fabulous yurts with sooo comfy beds. The weather was cooler but I enjoyed keeping the log burner going. The yurts ate very cosy. The hot tub can get very hot! We stayed with our 3 children aged 7, 5 and nearly 2 for 2 nights. We arrived to some delicious lemon and almond cupcakes and an immaculate and luxurious yurt. On a clear night, which unfortunately we didn't have, the clear roof at the top would mean you could star-gaze or you could choose to do this from the hot-tub. The children loved seeing all the animals and running around in the field. A visit to the farm shop is a must as Kirsty is extremely helpful and the meat was delicious. We would definitely recommend a stay at Country Bumpkins. We recently spent two nights in Ginger and Pickles. The site and yurt are beautifully presented with (thank goodness) a lovely bathroom which we had exclusive use of (there are two and only three yurts so lots of privacy). The kitchen had everything needed and we loved the hot tub, which was a great experience for our afternoon on site. It’s also right next door to some gorgeous highland cows, which were having babies when we came...so fluffy and adorable they melted our hearts! There were 5 of us in the yurt but it wasn’t crowded at all the the beds were really comfortable. Have already recommended it to friends! 1 small yurt (sleeping 2) and 2 large yurts (sleeping up to 6 each). Glamping only. So tents, campervans and caravans – no. Families, couples, groups of up to 14 people, dogs (£5 per night) – yes. The small yurt has a king-sized bed while the larger ones have a double bed and 4 singles (all bed linen and towels supplied). 2 bathrooms both with shower, wash basin and composting toilet. Plugs available for hairdryers, straighteners and electric razors. 1 communal kitchen with an electric hob, microwave oven and fridge (all pans, crockery and cutlery supplied). Yurts are solar powered which allows for lighting and for phone and tablet charging. 1 wood-fired hot tub on site. This is a working farm, so you'll see sheep, pigs and cattle during your stay. They are in a separate, fenced off, field next to the yurts. However, sheep may roam around the glamping site from time to time to keep the grass cut. There's a community veg garden, orchard (at certain times of the year you will be able to get involved in the fruit picking) and regular events are held on site, including food making courses in the farm shop, summer BBQ’s and wine tasting to name a few. Walking and cycling are always a popular starting point. The farm has direct access to Brampton Valley Way – a popular local route – and the town of Market Harborough is within walking distance (it's less than 2 miles on foot). It's a lovely town; great for shopping, eating out and learning the local history. By car, meanwhile, you can head further to find Northampton (15 miles) and Leicester (20 miles), each full of history and with plenty to occupy you on rainy days. 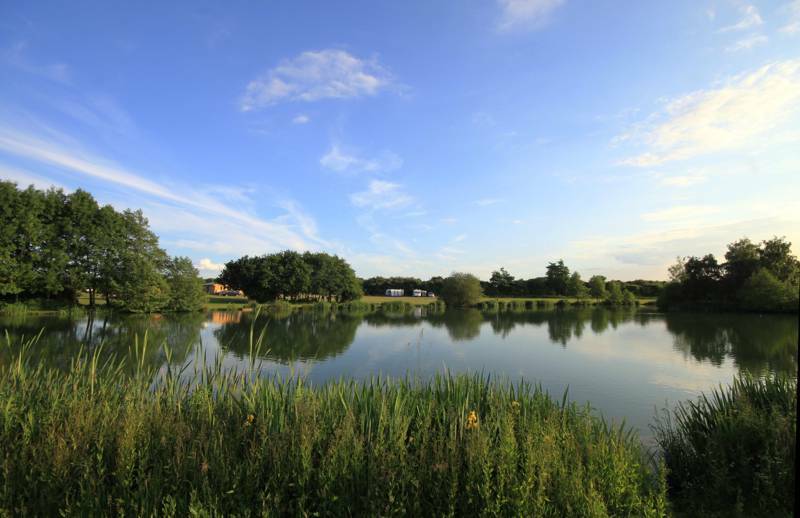 The local fishing lakes (¾ mile; 01858 434098) are just down the road and historic Kelmarsh Hall (2½ miles; 01604 686543) opens its house and gardens during the holidays. To truly unwind, there's also a meditation centre (3 miles; 01604 686778) nearby! Our new Canvas Cafe on site is a unique and tasty place to eat. Breakfast, brunch, lunch and sweet treats available everyday. Special extras on offer, such as local food and drink hampers, and afternoon tea delivered to your yurt. The farm is also home to an award winning farm shop – Waterloo Cottage Farm Shop (01858 467158) – so there's no excuse not to have a big old barbecue for all the gang! For the nearest pub, hop to The George in Great Oxendon (01858 465205; less than 400ft away) – newly refurbished and serving excellent food. For anything else, there are plenty of cafés and restaurants in Market Harborough. From the A14 leave at junction 2 and follow signs for A508 Market Harborough. Follow the A508 towards Market Harborough for 3¼ miles (approx. 5 minutes) until you reach Great Oxendon. Keep following the A508 through Great Oxendon, you will pass The George pub on your right and Country Bumpkin Yurts is 120 metres beyond the pub on your right, before exiting the village. Alternatively, from the Centre of Market Harborough Town, follow the main High Street (High Street/ A4304) Signposted Northampton (A508) and leisure Centre. Continue straight onto Northampton Road and continue for just under a mile to a roundabout. At the roundabout, take the 2nd Exit onto Northampton Road (A508). Continue to follow for approx. 1½ miles. Enter the Village Great Oxendon. Country Bumpkin Yurts (also Signposted Waterloo Cottage Farm Shop) is a few metres on your left. The nearest train station is in Market Harborough (0845 748 4950) 2½ miles away. It is on a direct line straight into London in less than an hour. There is also a regular bus service into Northampton or Market Harborough (the X7 service) every hour.